AISCL: The Windows PC and Server Backup utility program AISBackup. Thank you for visiting Aquarius I. S. Consultancy Limited. Aquarius I. S. Consultancy aims to supply low cost, high value, utility software to home and business users having features normally only found in software aimed at large corporate businesses. Indeed, corporate businesses may prefer to look here for a Windows PC backup and a Windows Server backup solution. AISBackup: One product for Windows PC and Server backup and restore. AISBackup provides a Windows PC backup and Windows Server backup and restore utility program of data and the Operating System to Internal and External Disk drives, Network drives, FTP Servers, CD, DVD, and all other media that looks like a disk to Windows. 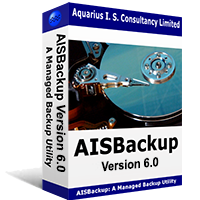 AISBackup is designed for all Windows operating systems from Windows 95, so whether you require a Windows Vista backup, Windows 7, Windows 8 backup, Windows 10 backup or a Windows Server backup program or even a Windows 95, 98 and ME backup program you will find AISBackup a suitable solution. AISBackup backs up Server application data, for example SQL Server backup and Microsoft Exchange backup without additional add-on software. Feedback has told us that some Users are happy using AISBackup to backup and restore data from their Mac and Linux computers using network shares. However, AISBackup is not suitable for backing up or restoring the Operating System from Mac or Linux computers. You are invited to download and try AISBackup for 30 days. A 30 different day trial may be downloaded from the AISBackup download web page or directly from this download AISBackup link. A 30 different day trial does not expire after 30 calendar days but instead after 30 different days of use. Using AISBackup for the first time on a PC. Restoring files and folders including restoring Windows XP files to Windows 7. Cloning or copying Windows from one drive to another. Disaster recovery using the AISBackup bootable restore CD or USB Flash drive. You may purchase AISBackup from our re-seller Register Now using all major credit and debit cards. U. K. Customers may pay by cheque in U. K. pounds. Please click here for more information. For multiple copies of AISBackup please see here. Once you have purchased AISBackup there is no further charge for upgrades. Just download the new version of AISBackup and install over the top of the existing version. We also keep AISBackup backward compatible with your old backups, although backups made on the current version of AISBackup may not be compatible with older versions of the program - AISBackup will suggest that you download and install the latest version. If the software is for home use we will honour two licenses per household per purchase, so that you may use the software on your laptop or second home desktop computer. The additional key may be applied for at any time and is available to existing customers. October 2018: Fixed some issues with restore, initial support for Server 2019. July 2018: Version 5.1 released - resolves problems backing up files named in some UNICODE encoded languages, for example file names written in the Thai language. August 2017: Version 5.0 released with the backup to local hidden (partitions without a drive letter) and local internal and external AISBackup partitions. July 2017 Coming soon: Backup to hidden and AISBackup partitions. AISBackup partitions cannot be assigned a drive letter either by design or by accident. AISBackup partitions may be converted back to regular hidden partitions or a partition with a drive letter. Work is also in hand to backup to AISBackup partitions over a local area network. It is hoped that using partitions that are not accessible using regular Windows applications will offer some protection against encrypting viruses. July 2016: Support for Windows Server 2016 added - pre-release version 4.3 (460). June 2016: AISBackup version 4.2 build 459 released. This version includes an option to make the recovery media using a Windows 10 based environment, the recovery media is compatible with previous versions of Windows but requires booting in 'Legacy' mode on PC's that support UEFI. The Windows 10 version of the recovery media supports most USB3 ports and extra network interfaces. See version history for a list of updates to AISBackup. August 2015: AISBackup version 4.1 build 452 released. This version supports the official release of Windows 10 and corrects a problem with the copy disk option when cloning a Windows 10 partition. See version history for a list of updates to AISBackup. April 2015: AISBackup version 4.0 build 450 released. This version supports Windows 10. See version history for a list of updates to AISBackup. April 2014: AISBackup version 3.3 build 445 released. This version corrects the button captions were large font sizes have been selected on the PC. This version also recommends changing the backup file extension to reduce the affect of malicious software that targets files with the .zip file extension. See version history for a list of updates to AISBackup. January 2014: AISBackup version 3.3 build 441 released. This version contains updates for all versions of Windows including the ancient Windows 95. Support for GPT disks, Windows 8.1 and Windows Server 2012 R2. IMPORTANT October 2013: A fix has been made to backup Widows 8.1 in the pre-release version of AISBackup. User's of Windows 8.1 should install this pre-release version, available here. This pre-release version includes updates for GPT disks and EFI booting, testing has not been completed on restoring MBR copies of Windows and the boot files to GPT, EFI enabled disks therefore this version is not suitable for general release. However, if your PC has a GPT disk and EFI boot capability you will be pleased to know that the EFI boot volume can now be backed up with this version of AISBackup. February 2013: Watermark and re-size images freeware, download here. AISWatermark may be used to print transparent text in the centre or bottom left of an image file. Images may also be automatically resized to web-site friendly JPG or PNG files. Improved open exclusive backup file support with 64-bit Windows; There is no longer a requirement to activate System File Protection and it is now possible to mount TrueCrypt drives as external drives (previous versions of AISBackup required that TrueCrypt volumes be mounted as removable drives). Now possible to make a Restore USB Flash Drive with Windows XP and Windows Server 2003. Version 3.0 released: Support for Windows 8, bug fixes and some performance improvements. This update also includes fixes and updates for all versions of Windows. What's Old News? 18 years of milestones. October 2000: The prerelease version of AISBackup could be used to make disaster recovery backups of Windows 98 and Windows 95; the same backup was used to restore Windows 98 back to October 2000 on a Windows 7 virtual PC to make this video about dual boot 98 & XP disaster recovery. February 2001: AISBackup was released and the first sale was made a few days later. October 2002: Integrated CD and DVD support added so there was not longer a requirement for a third party packet writing system. May 2003: Disaster recovery support for Windows XP, however open exclusive file support was not available. Programs and services can be automatically stopped and restarted to reduce the affect of open and locked files such as the outlook e-mail file. May 2004: Server 2000 and Server 2003 support, including disaster recovery, active directory, SQL Server etc. Open exclusive file support was still unavailable so SQL Server had to be closed prior to backup and then restarted - all automatically. August 2004: Drag and drop restore option added so you know exactly where files and folders are restored. Possible to drag and drop folders containing many gigabytes to different drives - Windows programmers are likely to tell you that this is not possible. October 2005: At last! Open exclusive file support for NTFS drives. Programs and services no longer need to be closed prior to backup. July 2006: Support for Windows Vista added. February 2008: Hard link file support added - a must as Windows Vista uses thousands of hard links. Simplistically a hard link is the same file on disk with two or more names (in different folders). Change one file and the 'other' changes because it is physically the same file. May 2008: Support for 64-bit Windows, open exclusive file support was not supported on 64-bit Vista or 64-bit Windows Server 2008 without using AISFAM. Open exclusive file support on 64-bit XP and Server 2003 worked okay. October 2008: It is now possible to make an AISBackup bootable restore CD for disaster recovery. March 2009: Windows 7 support added. May 2010: Open exclusive file backup support added for 64-bit Windows Vista and Windows 7. February 2011: AISBackup is 10 years old and the current version of AISBackup is able to make restores from backups made in version of AISBackup that was released in 2001. March 2012: Support for Windows 8 added. August 2012: Support for Server 2012 added. January 2013: Problems backing up open exclusive files to TrueCrypt drives on 64-bit system's resolved. January 2014: Support for GPT disks including the ability to backup and restore the normally GPT hidden partitions, for example the EFI boot partition. August 2015: Support for Windows 10. July 2016: Support for Windows Server 2016. Just like Sir Tom Jones, Sir Anthony Hopkins and Catherine Zeta-Jones, Aquarius I. S. Consultancy was made in Wales. Aquarius I. S. Consultancy Limited, 66 Heol Gabriel, Whitchurch, Cardiff, CF14 1JU, UK.